Finding out who the top performing startup investors of recent vintages will be takes time. As investors are quick to point out “lemons ripen first” and the most valuable companies can take 6 to 10 years to realize their full potential. We’ve created our portfolio momentum rankings to explore non-financial leading indicators, which may or may not indicate these managers are on the path to financial reward. The question we seek to answer is: across the entire portfolio, how much average momentum do this investor’s companies have? As of publishing, the top 10 overall portfolios are Fuel Capital, Vaiza Investments, Pejman Mar Ventures, Cowboy Ventures, Kalaari Capital, Bezos Expeditions, CAA Ventures, FundersClub, Slow Ventures and Lerer Ventures. Start your own free trial of Mattermark Professional today to research these investors and their portfolio companies to understand more about where they are focused and what signals lead to these rankings. Momentum in Mattermark is measured with something we call the “Mattermark Score” which works a bit like PageRank, taking into account various signals and combining their rates of change over time to get a sense of the directional growth of the company. The signals we currently use to calculate the score are estimates website visitors, estimated mobile downloads (were applicable), inbound links, Twitter followers, Facebook page likes and LinkedIn followers. Rankings include all investor portfolios we track that have 15 or more un-exited portfolio companies. New scores and rankings are calculated daily, and the “Trending” column will show the delta in weekly position, once this has been running for 1 week. Curious to understand more about the methodology? 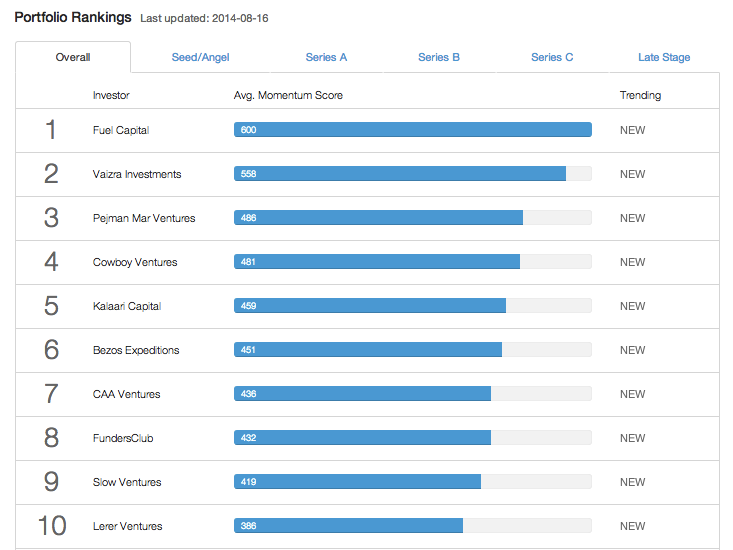 Read a more detailed description of the Mattermark Score here. In the months since we released our rankings we have begun receiving IRR data from investors privately, which will help us ultimately complete a backtest. In the meantime, several investors have reported sharing their results with current and potential limited partners as a jumping-off point for a discuss about interim success metrics beyond financial returns. Check out the latest portfolio momentum rankings.